Price Wars! 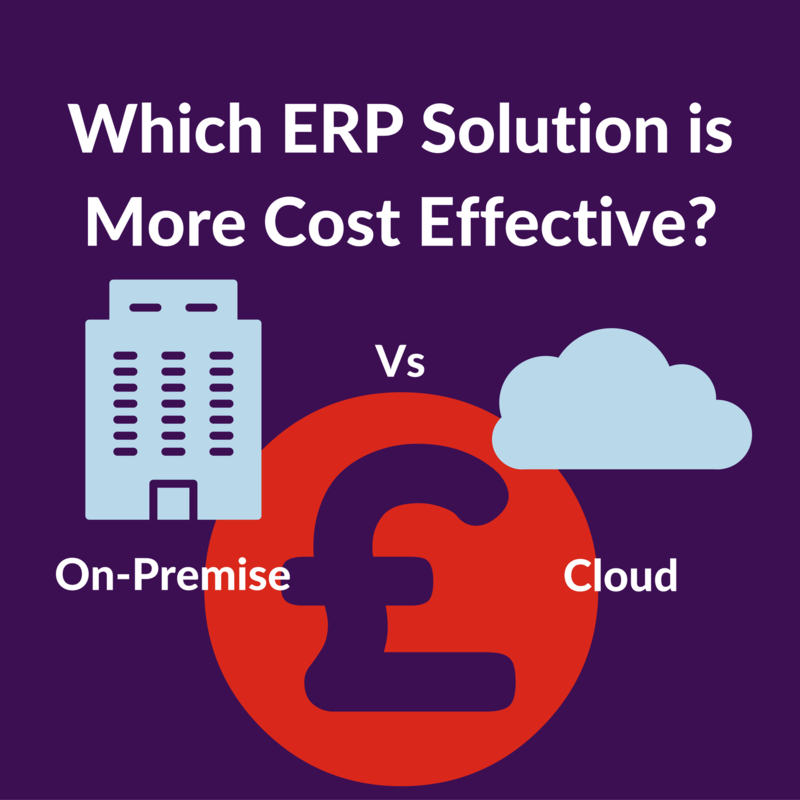 Cloud ERP vs On-Premise: How do the Costs Compare?. When selecting a new enterprise resource planning (ERP) system, one of the key factors in your decision will be whether you choose cloud ERP or on-premise ERP. Cloud ERP systems have become much more popular in recent years—especially among small to midsize businesses. But there are still many reasons why a firm might choose a traditional, on-premise system. After previously discussing the security concerns many businesses have regarding Cloud ERP, it’s now time to discuss another major factor – costs. The biggest difference between these two systems is how they are deployed and it is this that has a major influence on the costs. As we know, cloud-based ERP software is hosted on the vendor’s servers and accessed through an internet connection. With this type of deployment – Saas or Software-as-a-Service – the software and data is managed centrally by the ERP vendor. On-premise software is installed locally, on a company’s own computers and servers and managed by their own IT team. Some vendors also offer “hybrid” deployments, in which cloud software is hosted on a business’s on-premise servers. On-premise software is generally priced on a license fee based on the size of the business or the number of users required. As a result, on-premise ERP systems generally involve a large investment up front plus annual maintenance along with upgrade costs. Cloud software is priced under a monthly or annual subscription basis. A key difference with cloud-based ERP software is that system upgrades and enhancements are released on an ongoing basis and the costs are wrapped into the subscription costs. 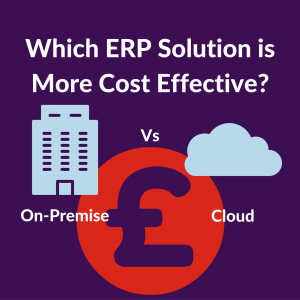 When cloud ERP first made an appearance, the overall software costs and total cost of ownership was markedly cheaper than on-premise. However, we’re now seeing instances where the cost differentials of each are not so wide apart – it’s a different cost and payment model, but the gap in the total cost of ownership is narrowing. Although Cloud ERP vendors, such as Netsuite, cite industry analysts that report cloud-based ERP can cost 50% less than on-site ERP for a 100-employee company over a 4 year period. For both approaches, you also need to consider the additional professional services costs – implementation, support, training etc. The theory is that a cloud implementation should be a shorter, sharper more agile exercise than traditional ERP. And therefore the implementation costs should be lower. Again though, that’s not as clear cut as it perhaps once was. As discussed in my previous blog, the management, maintenance and security of the hosted environment the ERP system is hosted on, rests with the supplier. This can provide significant cost savings as organisations don’t have to employ a devoted IT team capable of the management of the software and hardware for a system on the scale of ERP. For many companies though, cloud ERP is not a viable option yet as they don’t have the internet infrastructure to support it: so that’s another cost to consider if it’s not already fit for purpose. When starting to strategise and select an ERP the final decision must always come down to what is best for your business model, future plans and of course the people within your organisation. As with everything in life, sometimes the cheapest option is not the best option just as much as sometimes the most expensive option isn’t the right one. Our advice is to dedicate some time and effort up front to drive out a robust business case which considers the total cost of ownership of the various options and can determine a clear ROI path. Being independent, 100% impartial expert ERP consultants, the advice we provide is always tailored to meet your needs as a business. If you would like to talk to us about how we can help you with an ERP project please CONTACT US.